Greg Hooper Logging is a Jackson, Tennessee based family owned timber company that buys timber and/or timberland throughout West TN and surrounding areas. Greg started out working for his father’s logging company in 1985 learning all aspects of the business before founding his own business in 1991. He comes from a family with over 100 years in the timber industry. 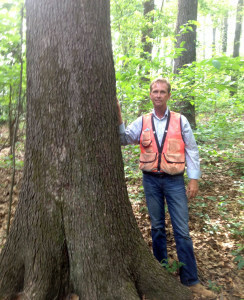 He meets high industry standards as a Master Logger through the Tennessee Forestry Association. Greg has also been awarded “Logger of the Year” and has been featured in “Southern Loggin’ Times” magazine. At Greg Hooper Logging, we harvest mature timber that is ready for harvest. This allows room for new tree seedlings to continue the forest cycle. Each landowner’s particular site is different, this is why we determine a size to best suit your property after we have finished an evaluation on your timber. If Greg decides you should wait about harvesting and let your timber mature for a better product, then he will advise you to do so. This makes for a healthy well managed forest. Greg is always conscious about our environment and renewable resources. Copyright 2019 Greg Hooper Logging, LLC. | Website designed by Roe Graphics.